This late 18th century painting of Shinobazu Pond by Odano Naotake (1749-1780) is representative of what is now call the Dutch-Painting (RANGA), a style that flourished for a mere 7 years in the remote Akita domain (now Akita Prefecture) in northern Japan. The school is characterized by its combination of three painting traditions- Chinese (in the choice of motifs – such as the auspicious peonies depicted in the foreground here – if you look closely you can see ants crawling up them! ), European (in the distant landscapes, the use of single-point perspective) and Japanese (in the actual painting materials themselves). The fascinating exhibition at the Suntory Museum in Tokyo not only shows the best extant works of Akita Ranga but also shows us why such a school of painting would have arisen so far away from any major cultural center. 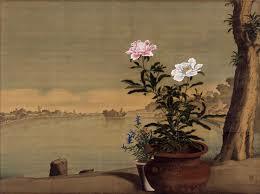 Beginning in the year 1633, Japan entered a period of national seclusion (SAKOKU) that officially lasted till 1866. During those 230 or so years, the only contact Japan had with the outside world was with the Dutch at the trading post of Dejima (a tiny artificial island in Nagasaki Harbor) with the Koreans and Chinese at Tsushima (also Nagasaki) and with the Ryukyu Kingdom ( whose trade was a monopoly of the Satsuma Clan (now Kagoshima Prefecture). 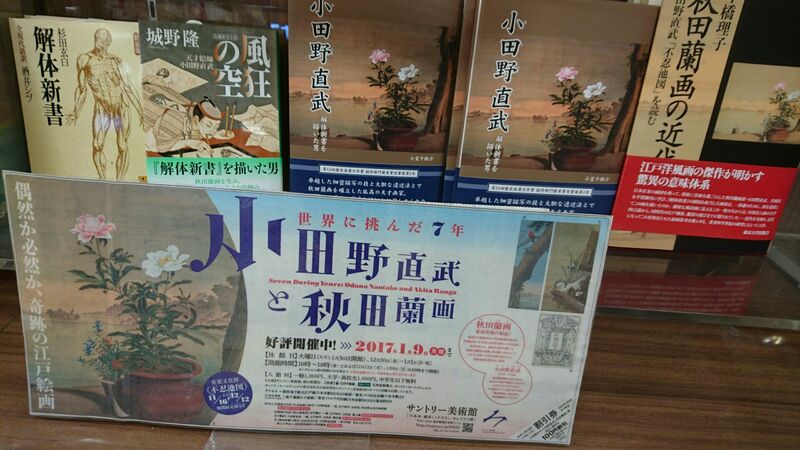 Given this state of affairs, the Japanese art-history world was astonished back in 1930, when the Nihon-ga (modern Japanese style) painter and native of Akita Prefecture, Hirafuku Hyakusui, published a work called Nihon Yoga Shoko (The Dawn of Western-style Painting in Japan). In it, he re-introduced a unique and long forgotten school of painting that had thrived for seven short years in his home region in the late 18th Century. The three most accomplished practitioners of the style were all samurai of the Akita Clan – the Satake (who had long ruled Hitachi Province (now our own Ibaraki Prefecture) before being forced to move to Akita in the early 17th century. and most importantly – Odano Naotake 1749-1780, a samurai from Kakunodate, who was the most talented and influential of the bunch. The superb exhibition put together by the curators of the Suntory Museum in Tokyo, explain and carefully – just how the short-lived and fascinating school of art came to be born – and eventually fade away into a long obscurity. Hiraga Gennai (1728-1780) – was one of the most interesting characters of the entire Edo Period (1603-1868) born in Takamatsu on Shikoku Island, Gennai eventually gained national fame as a writer of fiction, herbalist, inventor (most famously of hos electro-static generator, and entrepreneur. He met Odano in Akita while he was up there checking out the copper-mines. Later, in Edo, Gennai introduced the talented young artist to his “Dutch-studies” friends who helped (thorugh books) him master various techniques of Western Art – including single-point persepective and Chiaroscurro. Odano Naotake was born and raised in the isolated town of Kakunodate (now famous for its cherry-blossoms, old samurai houses, and cherry-bark crafts called KABAZAIKU). 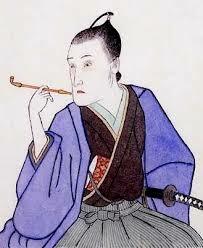 He received a typical samurai education which included cultivation in the arts – including painting. Naotake showed early on that he had a special talent. A teacher who belonged to the famous Kano School was brought in to instruct him and the young man became skilled in various genres of Japanese art. Odano`s life changed though when he met the great Edo Period polymath Hiraga Gennai, who had been invited to Akita to help develop some copper-mines there. 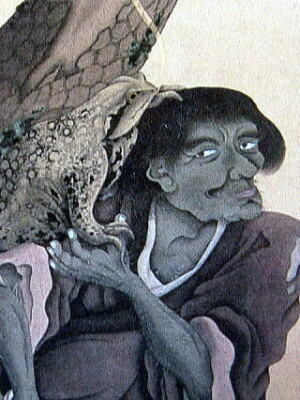 After Gennai returned to Edo, Odano was sent to be near him as a “copper-mine liason”. 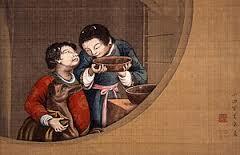 In the Shogun`s capital, Gennai introduced Odano to his circle of Dutch-scholarship (RANGAKU) friends. They would try to learn as much as possible about what was going on in Europe through books they could obtain from the Dutch at Nagasaki. At that particular time they were working on a major project – the translation of an anatomy textbook. And they needed someone to do the illustrations. Odano was the man for the job. The experience opened up his eyes to European techniques of drawing and painting that would be the foundation of Akita Ranga (Akita Dutch-Paintings). 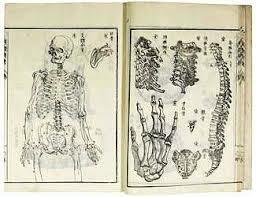 Illustrations by Odano in the KAITAI SHINSHO (1774), a translation (by Sugita Genpaku) of a European anatomy textbook. It was working on this project that enabled Odano to master Western techniques of painting and drawing. 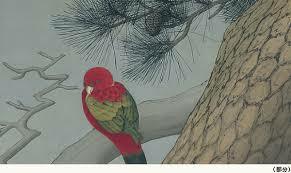 It also happened, that while Odano was in Edo a style of painting called the Nanpin School was all the rage. 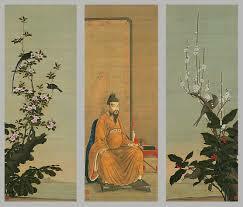 It had come to Japan back in 1731 with the arrival in Nagasaki of a Chinese artist called Shen Nanping. The most distinctive feature of the style was the use of auspicious motifs – mostly plants, flowers and birds that were considered “lucky” in China. 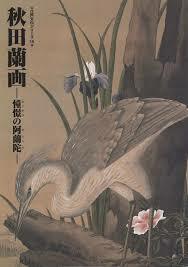 Gennai had many artist friends who worked in the style – and it is obvious from his ubiquitous use of flowers and birds as motifs in his works, that Odano was greatly influenced by the Nanpin artists. Emperor Taizong of the Tang, Bird and Flower Landscape by Odano Naotake (late 18th century) This typical Odano work demonstrates how he used traditional Chinese “auspicious” motifs. By integrating the artistic ideas he encountered in Edo, Odano created what we now know as the Akita Ranga. After he came back to his domain, his new style spread to other enthusiasts there. 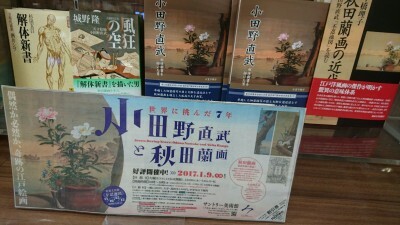 The Lord of Akita, Satake Shozan, actually wrote two treatises on Western art – Gaho Koryo ( Summary of the Laws of Painting) and Gato Rikai (Understanding Painting) in 1778. For a period of several years, members of the new “school” churned out works depicting brilliant and realistic auspicious flowers and birds, etc. with mysteriously distant backgrounds – which remind me of the scenery Da Vinci painted behind the Mona Lisa. 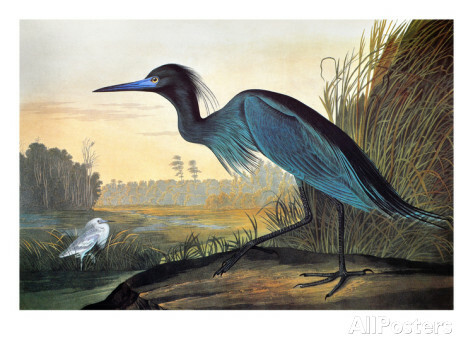 One thing that struck me was how similar the work of the great French-American bird painter John Audubon (born 1785) was to that of Odano! I uploaded this pic so you could compare! The end of the story come quite abruptly. Hiraga Gennai was arrested for murder (he killed someone in a rage) – and as was the custom during the days of the Shogunate – all his associates were arrested as well. Odano was arrested in Kakunodate. He died in prison at the age of 31. Gennai died in prison as well – and the Lord of Akita, Satake Shozan followed them not long after…. And that is why after 7 short years, Akita Ranga slowly faded away… forgotten… till rediscovered by Hyakusui in the early 20th century. And now we have this truly fascinating and tastefully curated exhibition – with 168 pieces in all – not only typical RANGA , but also the works that influenced the artists who painted them. You can also see Odano`s pre-Ranga paintings and prints – and some pages from the anatomy book he illustrated. 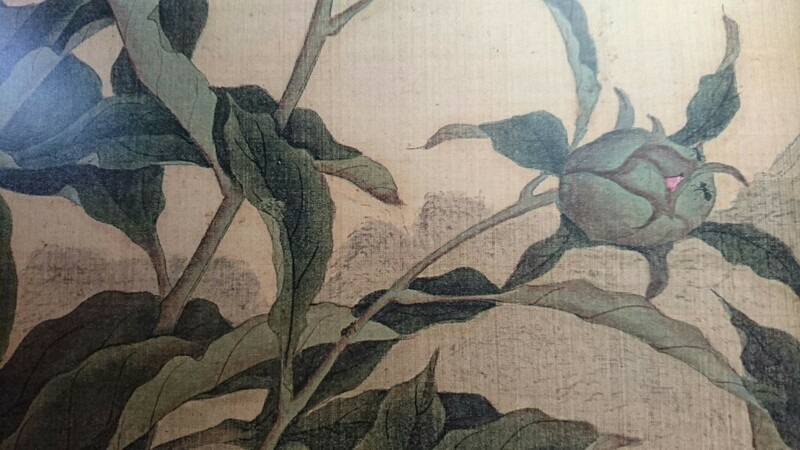 A closer look at Odano`s Shinobazu Pond scene (show at the top of this post) reveals an ant crawling on one of the peony buds! Kudos to the curators. They reaffirm once again my belief that Tokyo is THE greatest city for exhibitions. 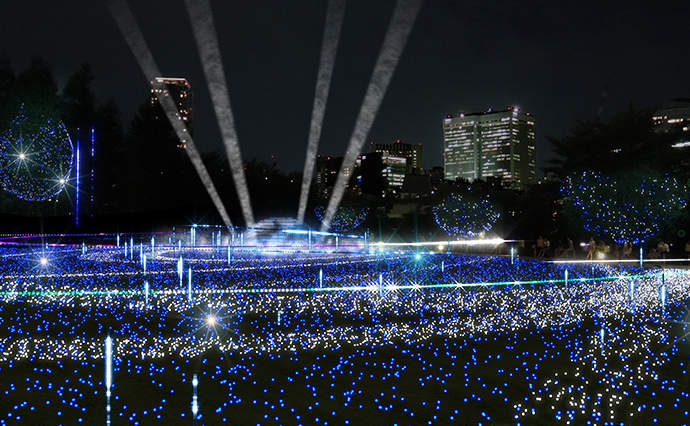 And if you do go see the exhibition before the 26th, you might want to hang around the Tokyo Mid-Town Building (in which the Suntory Museum is located) till 5 PM when the Christmas illumination is turned on. 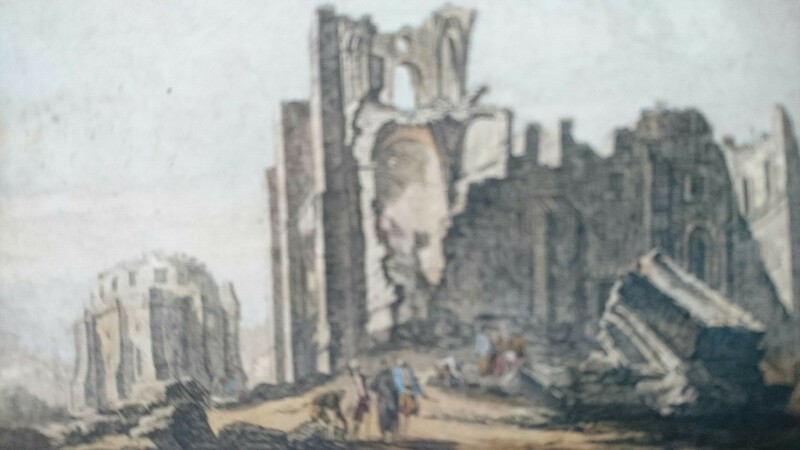 One of the last pieces being shown (in fact it`s just by the exit) is this novelty – a depiction of Lisbon in ruins after the great earthquake of the 18th century. This was one of the Western paintings that Odano and other could study as they tried to master European techniques of perspective, chiaroscuro, etc.